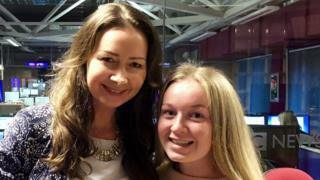 A teenager who saved her mother's life using cardiopulmonary resuscitation (CPR) has urged others to learn the life-saving skill. Melissa Doyle, 14, from Lisburn, County Antrim, was taught CPR in school. Her mother, Clare Hamilton, suffered a cardiac arrest at home in bed earlier this year. Miss Doyle carried out CPR until the emergency services arrived at the scene within four minutes with a defibrillator. CPR is a combination of chest compressions and mouth-to-mouth breaths, given in the event of a cardiac arrest. Miss Doyle, a Fort Hill Integrated College pupil, had been taught CPR by her school nurse Eileen McConnell using the British Heart Foundation's (BHF NI) Call Push Rescue training kit, a free resource for post-primary schools across Northern Ireland. At the time she thought she would never have to use it, but she did, just two months later. Her mother credits the training with saving her life. "On Friday 4 August I woke up like any other day. Melissa had slept beside me the night before and as my alarm went off I pressed snooze to go back to sleep. "The next thing I knew I was waking up in intensive care," she said. "Melissa heard me making a gasping sound. She thought I was snoring and then she realised something was wrong. "She tried to wake me up but couldn't. She then shouted for my husband when she realised I had stopped breathing. "My husband called 999 and they wanted to talk him through CPR but he couldn't do it. "Melissa said 'I've learnt this in school let me do it.' So straightaway she and my husband got me off the bed and onto the floor and got on with it and started doing chest compressions," she added. Explaining how she saved her mother's life, Miss Doyle said: "I was really nervous and panicking, but I knew I was just doing what I had been taught." The family was later told that the teenager's action bought her mother the time she needed before the emergency services arrived. "I'm so proud and grateful to her," Ms Hamilton said. "I dread to think what would have happened if Melissa hadn't been sleeping next to me that night. It was just meant to be." 85% of people in Northern Ireland would be reluctant to perform CPR on cardiac arrest victims, according to the British Heart Foundation (BHF NI). Only 18% of people in Northern Ireland can identify the signs of a cardiac arrest new figures suggest. A survey of people in Northern Ireland for the BHF NI also found that only 36% would feel confident giving CPR to a stranger. The main reasons for this is the fear of causing more harm than good (50%) and lacking the skills and knowledge to perform CPR (48%). There are more than 1,400 cardiac arrests every year in Northern Ireland, and less than one in 10 victims survive. However, if CPR is performed immediately, the patient's chances of survival can double. Jayne Murray, from BHF NI, said: "Most people think that if they had to perform CPR it might be a stranger in the street but actually most cardiac arrests happen at home and it's your mum, dad, child or sibling whose life will hang in the balance unless you act quickly. "We need everyone in Northern Ireland to learn this life-saving skill to give them the confidence to step in and give CPR when someone collapses after a cardiac arrest. "It could mean the difference between life and death."